In honor of National Donor Day, we share the story of the Taveras family. The Taveras family began their cancer journey in 2004 when eight-year-old Leandro was diagnosed with T-cell acute lymphocytic leukemia. After enduring two-and-a-half years of chemotherapy and radiation, Leandro was declared cancer-free. In the years that followed, Jorge and Katherine watched their son and his sister, Sofia, grow into wonderful young adults and celebrate many beautiful milestones. In 2014, Leandro was preparing to start college when the family suffered another setback – Katherine was diagnosed with Stage III Pancreatic Cancer. While her initial prognosis was grim, Katherine was determined to beat the odds and began months of chemotherapy, surgery and radiation. In the spring of 2016, Katherine’s battle continued while Leandro, who was halfway through his second year at Northeastern University, began experiencing new symptoms. Blood tests confirmed his leukemia had returned. 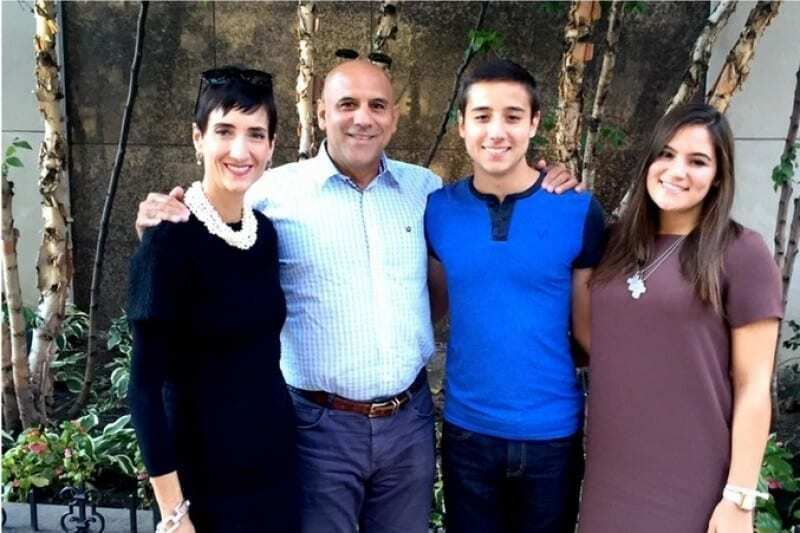 The supportive and strong Taveras Family (Katherine, Jorge, Leandro and Sofia). Independent and self-sufficient, Leandro has been determined throughout his entire life. His cancer journey is no exception. After relapsing, he began preparing for a bone marrow transplant and set a goal to make it back to campus for the first day of the fall semester. While this seemed unrealistic to everyone else, Leandro was committed. So was Sofia. Immediately, she was tested to see if she could be a bone marrow donor for her brother. Fortunately, she was a match. Without a shred of doubt, she made the decision to help save Leandro’s life. That June, right before starting her first year as an athlete at Gettysburg College, Sofia donated her marrow and gave her brother a chance at long-term survival. After a long recovery, both Sofia and Leandro began school last fall, fulfilling Leandro’s goal and inspiring everyone around him. Sofia is currently an ambassador for the Gift of Life bone marrow and blood stem cell registry, sharing her and Leandro’s story and motivating others to join the registry. Leandro is now completing a co-op at an engineering firm in San Jose, California. While still attending multiple doctors’ appointments to keep healthy, he loves California and everything it has to offer. Their mother is also beating the odds. As she manages the ongoing side effects of her life-saving surgery and more than a year of chemotherapy and radiation, Katherine is actively working towards recovery. Throughout this family’s cancer journey, the financial burden of the disease did not go unnoticed. Upon her diagnosis, Katherine was forced to stop working. Jorge became the family’s sole caregiver and provider. As they juggled the cost of two cancer diagnoses, they began to feel the weight of everyday living along with having two children enrolled in college. “Navigating the financial side of a cancer diagnosis was like taking on an entire new job, one that speaks a language I don’t know,” says Jorge. Family Reach was able to give Jorge and his family a sense of relief, assisting with their mortgage payment and allowing Jorge to return to work and focus on his family. Standing together, their strength and courage is an inspiration to us all.